This kind of supernova graph shows something perhaps worth more analysis — how organisations on github fork repositories. That is, the graph shows the connections between all the organisations (as elicited from the Github event timeline data) and repositories they fork (that is, make their own copy). The idea is to get some picture of how organisations structure the flow of forks and hence of code resources generally on Github. Are organisations an organising element here? It’s a hard problem because the organisations have very different modes of existence on github. Some, like ‘metacommunities’ are small informal groups of people, others like ‘mozilla’ are large official foundations. 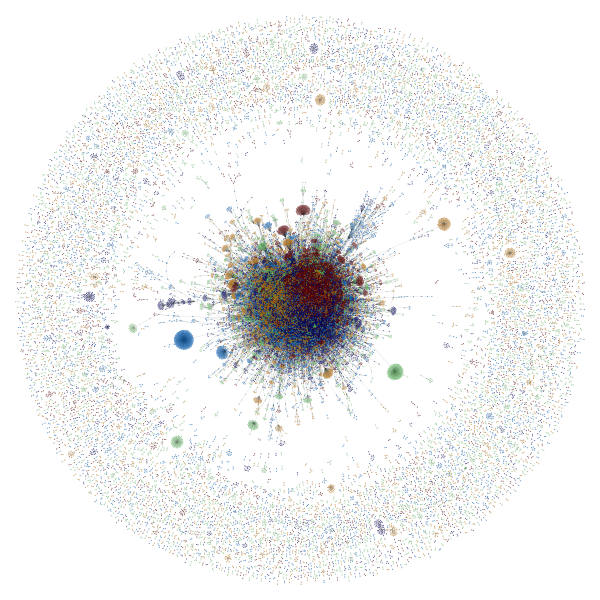 As the network graph shows, much of the organisational activity on github is not connected (the halo around the periphery), but that nucleus (coloured using a community-structure algorithm) shows a lot of connectivity that it would be good to unravel more.